Good. Doctor explained in detail about the solution to problem. Dr. Edy Soffer is an experienced gastroenterologist based in Los Angeles, CA. 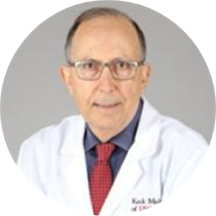 Dr. Soffer attended the Ruth and Bruce Rappaport Faculty of Medicine, Technion Israel Institute of Technology, where he received his medical degree, following which, he completed an internship at Soroka Medical Center. He then completed an internship and a residency in internal medicine at Coney Island Hospital. Furthermore, he completed a fellowship in gastroenterology at the University of Tennessee Health Science Center, Memphis. Dr. Soffer is affiliated with the Keck Hospital of USC and USC Norris Cancer Hospital. He is presently available for consultations at the Keck Medicine of USC. He is certified in gastroenterology by the American Board of Internal Medicine. He is a member of the American College of Gastroenterology, the American Gastroenterological Association, and the American Motility Society. Patients visit him for the treatment of celiac diseases, gallstones, stomach ulcers, ulcerative colitis, and a host of other specialized conditions. Dr. Soffer integrates his medical expertise with state of the art technology and strives to provide the highest quality of healthcare. He encourages open communication with his patients which allows him to guide them through their treatment as an active participant in their own well-being. Very informanent - Completely explained my choices. Very nice. Frustrating. Treats symptoms but won't go further to investigate. Requring patient to find information doctor should already have.